Throughout 'The World of Jake Paul' we follow Shane and Kati (the therapist) take notes on Jake's life. During this section of the series things start to get a little more entertaining such as seeing Shane Dawson's wild yet hysterical reaction to Jake's moderated gold cart. Shane Dawson sets himself a challenge to live life as the Paul brother, however it doesn't seem as he can keep up in Jake's reality. Jake shows a caring side when he discusses that when Chance left the Team 10 house, another member stole the account from him leaving him with no project to work on. The 21 year old discusses how he helped the former member by giving up his second account to lend a hand, he also supplied him with managers and editors of his own. Spoiler alert! We find out #Jerkia is in fact REAL! This part of the series opens up with Shane Dawson questioning Jake Paul about the drama surrounding the fight with Deji which he confirmed was 100% real. Jake also revealed that he is currently taking a break as he hasn't had the chance to take one in a while, and the drama in his life has recently reached a new level which even himself cannot cope with. One of the main targets in this episode is concentrating on the "assault" of Jake's assistant, Megan. 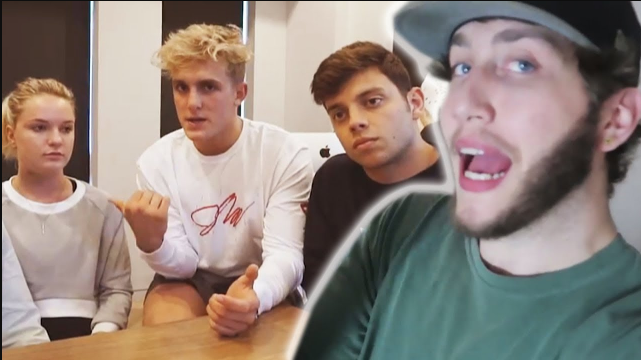 A lot of people believe that Team 10 drugged Faze Banks to create the whole drama however, Jake demands he had no involvement. Jake's assistant came back the house with bruises on her neck saying she had been grabbed by her throat, Jake took this opportunity to hit back at the man who "stole" his ex girlfriend, Alissa. As the series continues we find out Banks did not harm her in anyway which left Jake and Erika feeling betrayed. Moving throughout this episode Shane sits Erika down and tells her about him being accompanied by a therapist which she responds very positive too as she feels Jake does need help with some on going issues which is discussed in later episodes. Shane sits down with Alissa Violet during 'The Ex Girlfriend of Jake Paul' as she tells her side of the story. Shane visits Alissa's house to ask her questions about what happened during her relationship with Jake. Alissa originally met Jake when she lived in Ohio as she was very close friends with the Paul brothers, they then moved to Los Angeles and offered Alissa the chance to go with them to get her into a modelling career, as that is what she desired. She was originally used in the beginning as Jake's "hot girl" within his vines to get her some exposure. The pair began a fake relationship as Alissa believed Jake's videos where more popular when she was featured. This is how #Jalissa began. She confirmed when she was in Logan Paul's video "Jake I stole your girl" non of that was real as he needed click bait. Shane then goes on to ask if Jake has ever mistreated members of Team 10 which she responded "yes" as he was the father/boss figure of the house, when he arrived in the house they had to cancel whatever they were doing to assist Jake. Finally, what people really wanted to know was if the video Alissa made on Jake was truthful, she goes on to say she was treated differently, such as, when filming a video other people were simply nudged, but when it was her turn she was treated much harsher. She continues to say he was never really physically abusive it was more mentally. We finally find out why Jake is the way he is. In the beginning Jake was so connected with his fans and watching his previous videos it's very clear. Once the drama with his brother hit everything changed, forever. It was confirmed in a past episode that Alissa did sleep with Logan which many of us agree is very wrong, most of us wouldn't do it to a friend yet alone family. As this happened Jake opens up that he found it very hard to get over what happened to him and is actually still affecting him today as he speaks about trusts issues, thankfully he found something in Erika which helped him bring that wall down. Shane helps him through this by reminding him it's human to be sad and you don't have to constantly be strong. During previous episodes it was brought up that Jake hadn't taken down the assault video even though it had been confirmed as fake. Jake continues to hold his truth by taking out his phone and removing the video as doing so he say he didn't remove the video as he didn't want to bring attention to it. Watching this episode a lot of people have started to feel for Jake as we can really see the pain in his eyes which really hits home for some viewers. Below is a break down of everything which was covered in the episode in Jake's words. He says he personally scouted them from their hometown in Catalonia, Spain, taught them English, and mentored them in growing a social media following. Despite their claims of abuse and bullying, Jake says they were "just pranks" and that all of their videos were scripted. According to former Team 10 COO Nick Crompton, a company employee tried to add the house's address to an event on Google, instead, he accidentally published the address of google Maps, inviting hordes of fans to swarm the social media incubator. Fellow West Hollywood residents were furious that their street had become a tourist attraction for screaming preteens, which let to the KTLA profile and helped introduce much of the world to Jake Paul. He also admits that the massive pool fire he and his roommates set in the backyard was a mistake. Jake is incredulous that his merch-peddling is harmful to his young views. "Honestly i think it's really stupid that people think it's manipulative," he rants. "Just because my fans are younger, does that mean I'm manipulating them? I don't think a kid would actually believe that and be like, "Wow, i'm not cool if i don't have this!"" "It dramatically affected my business, just as much as it affected him, because people think we're the same." He says he lost two seven-figure brand deals because his name was so deeply tied to his brothers and admits that he didn't watch the video before it was posted. He also presents the fact his reputation was destroyed because of his brother. "My dad definitely helped when I needed him, and he was someone I could trust when I was bringing in new business people, but I basically already told him weeks ago that he should go back to Ohio. He should be my dad." That's the end of the Jake paul series! thanks for reading! Let us know what you thought of the series as a whole in the comments below!